The number of Gaelic speakers in Scotland has reached an all-time low, according to new figures. Numbers from the 2001 census, released on Thursday morning, confirmed the language is still in decline. The number of Gaelic speakers fell by 11% over 10 years to a figure of 58,650. This is the first time that the number has fallen below 60,000, bringing Gaelic close to the figure at which it is thought a language can no longer survive. John Randall, the Registrar General for Scotland, said: "The decline was not unexpected but it was less rapid than between 1981 and 1991." There are signs that the future of Gaelic is far from bleak. The decline in numbers reflects the death of many older speakers but it does not take into account the recent boom in Gaelic medium education. The primary school in Glasgow where all subjects are taught through Gaelic needs larger premises. And in Edinburgh, the city council has just started a series of informal drop-in parent and toddler sessions targeted at non-Gaelic speaking families. 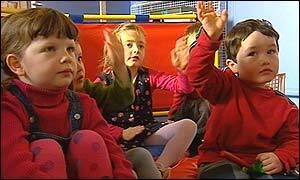 Ministers say schemes like these suggest Gaelic's decline may have been arrested. Census results also showed that 42% of Scots regard themselves as being members of the Church of Scotland, compared to 16% who said they were Roman Catholics. More than a quarter said they had no religion. "We're not surprised by the figures"